Game Information: Vikings is a NetEnt-powered online pokie game featuring 5 to 7 reels and 243 ways to 78,125 ways to win. As the name suggests, the game is based on the iconic TV series of the same name and features some stylish graphics and sound effects to really put you in the heart of the action. Featuring all the main characters you have come to love, join the adventures of the formidable Ragnar, along with his Viking crew Lagertha, Bjorn and Floki as they pillage villages, encounter challenges and come across some menacing enemies out for blood. Vikings is a low to medium volatility game, making it ideal for new players looking for a spectacular, thrilling experience, but without the high stakes that come with other pokie games of this nature. Boasting spectacular visuals and a solid gameplay, Vikings is an intriguing offering by NetEnt. The game boasts a great Hotspot feature, where Viking symbols trigger sensational scatter payouts. There is also a cool Shield Wall feature that triggers at random for more exciting winning opportunities. But the biggest chance to win is definitely the Raid Spins feature. If you manage to land 7 Raid Spins on a 7-reel set with 3 Hotspots, you score the chance to enjoy a payout of up to 10,000 times your stake! Before you start playing Vikings, you must place your bets. The coin value is determined by the +/- buttons, while the number of coins can be changed using the Level +/- section. There is a Max Bet option that will automatically allow you to place the maximum bet possible, while the Autoplay feature lets you play automatically for a determined number of spins. 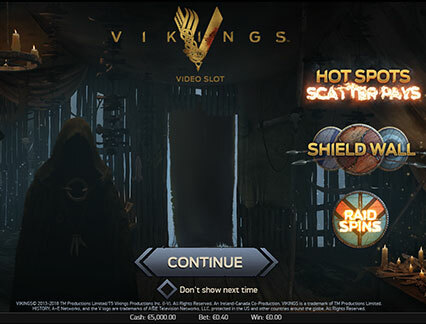 Vikings Online Pokie is packed with exciting features to give players the most authentic experience possible. Since the TV series is packed with action, your gameplay needs to be as exciting as well. Join the battle with Ragnar and friends with a Shield Wall feature, a Hotspot feature, a Raid Spins feature and a Raid Spins mode, where you will enjoy a further 3 Hotspots. 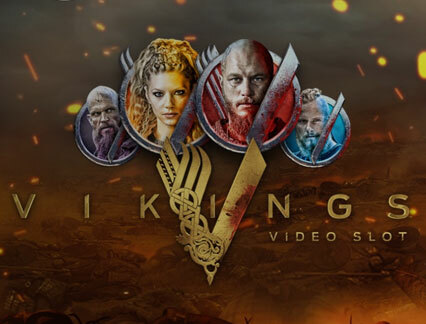 Hotspot Feature – You will see the main characters, including Ragnar, Lagertha, Floki and Bjorn line the reels, and as one of their fully stacked Viking symbols land in a Hotspot on the third reel, this feature will be triggered. Once the Hotspot feature is activated, it will turn all other Viking symbols on the reels into that symbol. This means that if you land Bjorn in the Hotspot, all the other Viking symbols will become Bjorn symbols as well, increasing your chances of winning big. Shield Wall Feature – The Shield Wall feature can be triggered during the base game or during the Raid Spins feature. This feature will be triggered at random. Once triggered, you will see a cluster of mystery symbols form in a random spot on the reels, which will then transform into one of the Viking symbols on the reels. If this is successful, you stand in line for some nice additional wins. Raid Spins Feature – This is the most lucrative feature of the game and triggering it will give you plenty of potential to win big while playing with 7 reels, 5 rows and 78,125 paylines. This exciting feature is triggered when you land 3 Raid symbols on the reels. Once triggered, you will receive 7 Raid Spins and a generous 3 Hotspots on the third, fourth and fifth reels. Land just one fully stacked Viking symbol on one of more of the Hotspots and it will change into the triggering Viking symbol – just like the standard Hotspot feature but the rewards are even better. Vikings is a visually stunning game that stays true to the TV series. Players are transported to ancient Norway at night, complete with Viking-inspired weaponry and an ominous black crow in the background. The five high value symbols are a large V as well as the most popular characters of the game, namely Floki, Ragnar, Lagertha and Bjorn. Additionally, the lower value cards are represented by blood-splattered 10, J, Q, K and A.
Vikings is not a progressive jackpot pokie, although there is a great top jackpot of 200,000. The game is low to medium volatility with an RTP of 96.05%. The main attraction of Vikings is definitely its bonus features, which is not only rewarding but quite unique to the game. With some decent free spin bonuses and a good top prize, this game is fun, exciting and quite lucrative. The added feature of 7 reels and 78,125 ways to win of course adds some extra excitement to proceedings.